"Black Friday" may be a thing of the past. That's because retailers are duking it out over who is the first store to open for the big annual holiday sales. As it stands now, Toys R Us and Wal-Mart will be the first large retail chains to open their doors for bargain hunters at 8 p.m. on Thursday, Nov. 22. That's even earlier than last year, when the toy store opened at 9 p.m. and Wal-Mart (WMT) at 10 p.m. Target (TGT) will open at 9 p.m. compared to midnight last year. While Macy's (M) hasn't officially announced an opening time this year, the department store usually opens at midnight. The early store openings might be an attraction to people who want to get a head start on their holiday shopping. But they are a bane for store workers. For many, it means having to miss out on Thanksgiving with their families. Curtis West worked in Macy's flagship store in New York City on 19 Black Fridays out of the 24 years he was employed by the retailer. West said the store's early hours forced him to sleep through his family's Thanksgiving celebration in order to rest up for his overnight shift. "Thanksgiving was definitely short with your family, and you hate it," he said. "People don't understand why you weren't there or why you couldn't stay." Macy's spokesman Jim Sluzewski said: "Unlike many other retailers, Macy's is not opening on Thanksgiving -- precisely so our associates can spend the day with their families. We ask for volunteers to staff the overnight shift and get very good response." 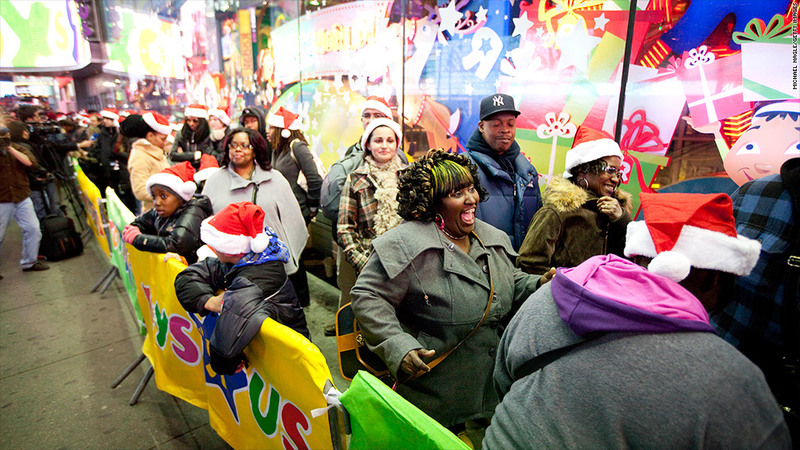 Workers have been taking a stand against the ever-shifting holiday hours. Last week, more than 20 new petitions were created on Change.org calling on retailers to push back their opening times to Friday so that workers can spend Thanksgiving at home. One of the petitions, started by Target employee Casey St. Clair, has already garnered nearly 170,000 supporters on the advocacy website. St. Clair is asking Target to "give Thanksgiving back to familiars and not open Thanksgiving evening." "Target can take the high road and save Thanksgiving for employees," she wrote. A Target spokesperson said the store's opening time was carefully evaluated. "Across the country, team member preferences were considered in creating our store staffing schedules. Thanksgiving weekend is one of the busiest of the year, and we appreciate our Target team's flexibility on this weekend and throughout the holiday season," she said. Stores have been jockeying to get customers in their doors on Black Friday for years. Retailers haven't yet fully recovered from the effects of the deep economic recession between 2007 and 2009 and the sluggish economic recovery that followed. The pressure is even greater this year because shoppers have been distracted from the presidential election in the last few weeks. Superstorm Sandy threw another wrench on shopping in the Northeast, where many malls and stores were closed due to power cuts. The National Retail Federation said looming fears over the "fiscal cliff" and the struggling jobs market could keep people from shopping. That's why the NRF predicted that holiday sales will rise by 4.1%, which is slower than the 5.6% increase last year.